Premium Compatible Label Tapes for the Brother P-Touch 2430PC printer. The Brother P-Touch 2430PC is a connectable, easily portable printer that generates durable and attractive labels. 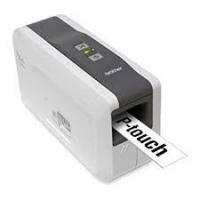 This makes the printer ideal for mobile labelling applications. This labelling machine is USB-ready and is very easy to use. The printer is compact as it measures 2.6 x 7.4 x 4.4 inches and weighs around 0.60 kg. The printer has a sleek design and it comes in white and grey colour. On the top, it has an indicator light and function buttons. The print output comes out of the front of the machine. The printer has a USB interface for connectivity. The printer also features a battery compartment, automatic cutter and AC jack slot. This labelling system can handle different width tape sizes of 3.5mm, 6mm, 9mm, 12mm, 18mm and 24mm. The software for this labelling system is not required to deliver labels. As the installation of the P-Touch editor software can give full access to database and barcode printing. Printing with Brother P-Touch 2430PC Label Tapes is easy. The printer can deliver all TrueType fonts at a maximum height of 18mm and it can multi-copy print 200 labels. The Brother P-Touch 2430PC prints waterproof plastic labels. It allows one to use a PC keyboard and screen to design the labels and without needing its software installed on the PC. It delivers high quality and durable labels and can even handle 24mm wide laminated labels but print speed is a bit slow. Q. How to install the tape cassette in the Brother P-Touch 2430PC? Q. Are my details secure with you if I order the compatible Brother P-Touch 2430PC label tapes from your site? A. Yes, all your personal information will remain protected and secured with us. We ensure you that no third party will have an access to it and we will not under any circumstances sell your personal information to any third party. Q. I want to print a label containing a barcode. Can I print barcodes on Brother P-Touch 2430PC? A. No, the P-touch editor lite is not prepared for a barcode function, so you won’t be able to print barcodes through the Brother P-Touch 2430PC Label Tapes. Q. How is the print head cleaning cassette used for cleaning the printheads? A. You must insert the print head cleaning cassette into the P-touch and then close the cover. Press the feed & cut button once or twice. Since the used Brother P-Touch 2430PC label tape is wound up into the print head cleaning cassette, no tape will be fed out. Q. I'm unable to print labels now even though I could somehow manage to print a little while ago. Can you please let me know the issue? A. Turning the power ON/OFF several times while displaying the print monitor screen may cause off-line of the printer driver and impossibility of the printing. To resolve such issue, open the [Printers / Printers and Faxes] folder of Windows to check whether the P-touch printer driver is offline or not. If it is offline then, close the print monitor screen and turn ON/OFF the power of P-touch a few times. This will probably resolve the issue. Even after doing so you are not able to print then, restart the computer. Q. Are Brother P-Touch 2430PC Label Tapes laminated thoroughly? A. These label tapes generate durable and attractive laminated labels. It protects the text printed on it from damage and any kind of weather conditions. You can be sure of its durability as the print won’t get fade away and remain intact for a long time. Q. Why a blank horizontal line appears on the printed label. What is the cause of such issue? A. Streaks or poor quality characters on printed labels generally indicate that the print head is dirty. If this is the reason clean the print head using a cotton swab or optional print head cleaning cassette. This might solve the issue. It is also suggested to not touch the print head directly with your bare hands while cleaning the print heads. Q. What is the print speed of the printer for printing out labels? A. The print speed of the label printer is around 10 mm/sec that is quite slow for an advanced printer.